• work practically in a collaborative and interactive manner within an international reporting team. At end of the workshop each participant will have written/produced an individual article/report for publishing in the BlueLink Stories regional e-magazine for public interest journalism. Successful participants will then have the opportunity to continue contributing stories on freelancer basis, from their own countries, as part of BlueLink’s virtual newsroom project. The workshop takes place in Cottbus, in Germany’s Lausitz area, which has been a centre of brown coal mining in open pit mining technique. The region is now affected by decrease of coal production due to the priority of climate protection. A completely new landscape is about to be created in not only geographical terms. The technological, social and environmental dynamics offers rich base for creative journalistic work, which we shall use for our workshop. Journalists (both aspiring and experienced) from Europe’s post-socialist countries and Germany, who are willing to work independently in public interest, covering climate change, clean energy as well as other issues related to environmental justice and democracy, are welcome to apply for participation. The number of participants is limited, so early applications are encouraged. Applications will accepted until Saturday, December 23, 2017 but will be reviewed on ongoing basis. Acceptance confirmations will be mailed out latest by December 28, 2017. No participation fee will be charged. Board and lodging will be offered free of charge to successful applicants for the duration of the workshop. The traveling costs will be covered. Arrival: 9th January 2018 Start of Program and welcome to the participants: 1 p.m.
Departure: 13th January 2018 End of Workshop and farewell: 3 p.m.
On day 1 the workshop will begin with setting up editorial work and establishing journalistic working methods to be applied, including: research, investigation, data collection, establishing credibility, handling sources, and story building. On day 2 knowledge gathering will begin by exchanges with experts on structural change related to offsetting coal power generation. Participants will chose between genres, such as interview, news, report, commentary, focusing on feature story telling skills. On day 3 we embark on a reporting trip to explore the site and make interviews. By day 4 we shall analyse information gathered, elaborate leads and story-lines, and participants will draft their pieces to complete the workshop. Furthermore lectures about relevant topics will be arranged. The last day is intended for writing and reviewing the articles for the website. • Dr Pavel Antonov, Executive Editor of BlueLink and course leader, at pavelan <at> bluelink.net. 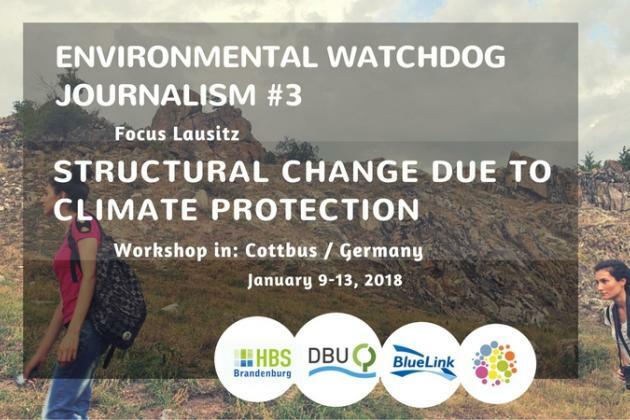 This activity is realised by the BlueLink Foundation and Heinrich Boell Foundation - Brandenburg as part of a BlueLink Virtual Newsroom project, supported by the German Federal Environmental Foundation (DBU) and Heinrich Boell Foundation - Brandenburg.